ST. PETER, Minn. – Four second period goals and a strong special teams performance by the Gustavus women’s hockey team resulted in a 4-0 win over Bethel Saturday afternoon in a MIAC semifinal playoff game at Don Roberts Ice Rink. The No. 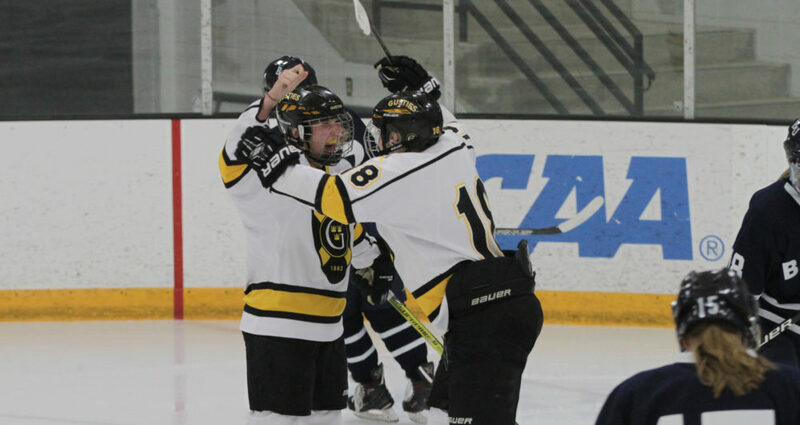 5-ranked Gusties scored twice on the power play and killed off five Bethel skater advantages to advance to the MIAC championship game for the first time since 2014. After a scoreless first period that saw the Gusties win the shot-count 16-5, Kaitlyn Klein (Sr., Plymouth, Minn.) scored her team-leading 23rd goal of the season 2:19 into the second frame on a power play. Nearly 12 minutes passed before Diana Draayer (Sr., Deephaven, Minn.) tallied her first of two goals in the game. Three minutes later, Amelia Vosen (So., Anoka, Minn.) recorded her ninth score of the season, and with 1:19 remaining in the period, Draayer notched her 17th goal of the season on another power play. Klein and Draayer both finished with three points apiece – Klein with a goal and two assists, and Draayer with two goals and an assist. Klein now has a team-leading 41 points and Draayer has 33. The Gusties out-shot the Royals 41-15 and went 2-for-3 on the power play. Amanda DiNella (Jr., Oakbrook Terrace, Ill.) posted the 15th shutout of her career after making 15 saves. Gustavus (20-2-4), who reached the 20-win plateau for the first time in five years, hosts Hamline for the MIAC Championship at 2 p.m. next Saturday. The Pipers defeated Augsburg 4-1 to reach the title game.